Born at sunset on the bend along the Macleay River and raised at Burnt Bridge in Dunghutti Country, “Muughi” (meaning Margret) was born into a family of 8 siblings, 4 brothers & 4 sisters. Margret, as the youngest member of her family, was schooled from the age of 5 onwards in her traditional custodianship, the Baranbyatti Mirra Buuka or Dreamtime Southern Cross. Growing up on Dunghutti Country on the North East Coast of NSW and in Yuin Country on the South Coast of New South Wales, Margret considers herself to be one of the lucky ones and treasures the rich legacy of her family’s Cultural Dreamtime inheritance. To spend time with Margret is to understand both the inherent living wisdom and practical relevancy of her Ancestor’s Dreamtime Blueprint and the tangible, multi-dimensional ways in which the Dreamtime still influences and shapes our modern individual and collective belonging to this land we affectionately call down under. At 65 years young, Margret has experienced some of Australia’s most turbulent political decades of racial injustice, inequality and discrimination and the revolutionary initiatives that evolved as a result. Notably, Margret was inspired by the Freedom Bus Ride in 1965 which, led by Charles Perkins, exposed the rampant racial discrimination in rural New South Wales and highlighted the need to provide access to justice for all Aboriginal people. However, as a 15 year old in the 1960s far from being disempowered Margret participated in Aboriginal youth programs such as, the Foundation for Aboriginal Affairs; and Margret benefited from being mentored by some of the last Century’s most visionary Aboriginal politicians, campaigners and spiritual and community leaders. Elizabeth “Trixie” Rowe (nee Campbell), Edith “Edie” Allan (nee Springhill), Charles Perkins, Esther Carroll, Charles “Chicka” Dixon, Ted “Guboo” Thomas and Uncle Max Dululumlum Harrison. Together they helped to define Margret’s understanding of a resilient Aboriginal kinship system and to develop the authoritative integrity with which she shares her Cultural Custodianship. During this period, Margret became affectionately known as one of Charlies Angels and to this day, Charlie’s other two angels, Norma Ingram, a Wiradjiri Elder and Mary Lou Buck, a Dunghutti elder, remain Margret’s two best and closest friends. In the mid 1970’s as a qualified Teacher and a founding member of Aboriginal Educational Consultative Group, Margret helped to fuel the debates on Australian schools and higher education institutions and on the inclusive needs of an Aboriginal cultural curriculum. Participating in the national campaign of raising the Aboriginal flag in Canberra’s Aboriginal Tent Embassy, even whilst heavily pregnant with her second son, Margret worked tirelessly in Sydney to help dispel the myth that the Aboriginal power movement was violent. Margret was was of the many Aboriginal mothers who gathered with their children from everywhere, across Australia, to help to mount an effective, peaceful protest. In the 1990‘s traveling the globe with spiritual visionary Ted Thomas, Margret visited Spain, France and Japan to attend a Global Indigenous Scientific Gathering aligning modern medicine with the cultural knowledge of indigenous healing. Ted or “Guboo” as he was affectionately called, recognized in Margret her rare eldership ability to carry on the legacy of his vision: to demonstrate the relevancy of Aboriginal spirituality to the 21st Century, and to reconnect all Australians to their shared cultural belonging through a mutual respect and love for the Australian landscape. Visiting and spending time often, still today, with Uncle Max Dululumlum Harrison Margret continues her own, ongoing initiation into the seasonal cultural ceremonies and custodianship, scientific, mathematical, environmental and geographical curriculum of Uncle Max’s beloved Yuin country and sacred teaching mountain, Gulaga, near Narooma on the South coast of NSW. Each of Margret’s Dreamtime Southern X products and tours are informed by her passionate desire to share her Dreamtime legacy and her understanding of our individual and collective need to walk country with respect, honoring Mother Earth’s annual and seasonal curriculumm of Sun and Moon cycles, Emu Star Women’s Dreaming, Kangaroo Star Men’s Dreaming, Whale Dreaming, Women’s Business and Dreamtime Totem and Kinship Lores. In addition to translating her cultural knowledge into school curriculums with the AECG, Margret also spent 6 years as a qualified teacher from 1985 - 1991 seconded to teaching Aboriginal Culture at the Sydney College of Advanced Education on Sydney’s University Campus; and in 1993 after returning from her global travels Margret began her Cultural Tourism Business, Sydney Aboriginal Dreaming which in 2012 she renamed Dreamtime Southern X.
Margret’s reputation across Aboriginal communities and the global Tourism market for her unparalleled ‘The Rocks Dreaming Aboriginal Heritage Tour’ has led to her being recognized as a Tourism Champion by Tourism Australia, Destination NSW, Indigenous Business Council, and endorsed by Australian Tourism Export Council (ATEC) Supply Nation, Indigenous Business Chamber of Commerce, and the former Governor of NSW, Her Excellency Professor The Honorable Dame Marie Bashir. The evolution, integrity and authenticity of the Dreamtime Southern X tourism products to the domestic and international tourism markets, corporate, government and educational sectors, and general public is inspired by Margret’s desire to build a mutual understanding and resilient respect between all Aboriginal and non-Aboriginal people grounded on a deep and enduring connection to the Australian landscape. 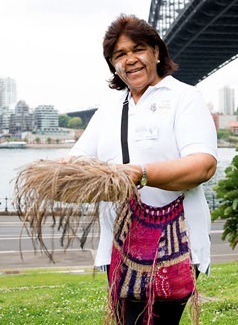 The uniqueness of Margret’s Aboriginal tourism approach is her living, evidence based, interactive experience where the stories and richness of the Dreamtime landscape interweave with modern living in downtown Sydney, one of the world’s most cosmopolitan cities. Integral to Margret’s Cultural custodianship is her desire to ensure that the world’s oldest continuous, living culture is shared, explored and respected not just with all Australians but beyond Australia. One of three family members to attend East Kempsey Primary School in 1954, Margret with her dark skin remembers the regular ritual of being washed with a bucket of cold water by the white students as they innocently attempted to remove the “black dirt” from her skin. Although, later in the same year she was returned to the segregated Aboriginal Mission School, this early experience highlighted for Margret the innocence with which our actions can cause division and discrimination and the ways in which we must constantly and actively seek to rebuild bridges of reconciliation. Margret narrowly avoided becoming a statistic of the Stolen Generations when the early death of her Mother put her at risk of being forcibly adopted out to a white family. Thanks to the foresight of her Father and his 2 elder sisters, who under the Aboriginal kinship child rearing practices became “Mothers” to Margret, she remained within her biological family until her Father remarried. Now the sole survivor of her family of 8 siblings Margret’s life mission is to build a legacy for all children to see and inherit an Australian landscape as rich in the Dreamtime as it has always been and will always be.